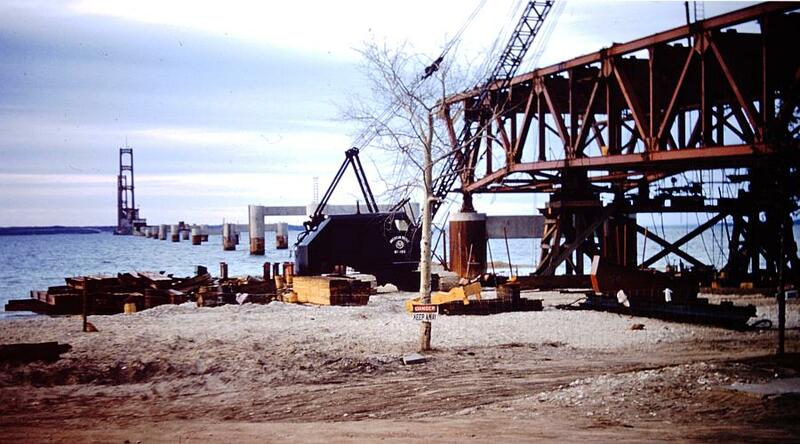 The Mackinac Bridge piers are in place and the framework for the deck is being strung across the piers in the spring of 1956.
before the spinning could begin. anchorages and over the towers. The 24.5" completed cables contain over 45,000 miles of wire. 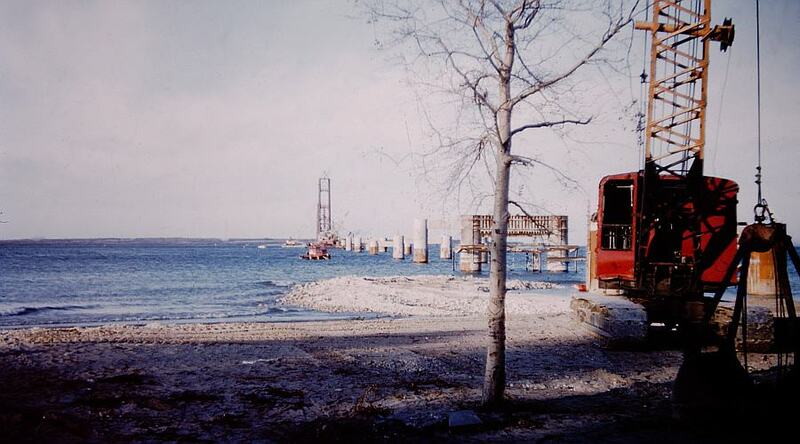 Placing the first section of the bridge superstructure on the piers on the south side of the Mackinac Bridge. The foot of the Mackinac Bridge on the Mackinac City side. The main entrance to Colonial Fort Michilimackinac was later built next to the cement pier on the right. The Grand Hotel on Mackinac Island and a car ferry can be seen in the distance. 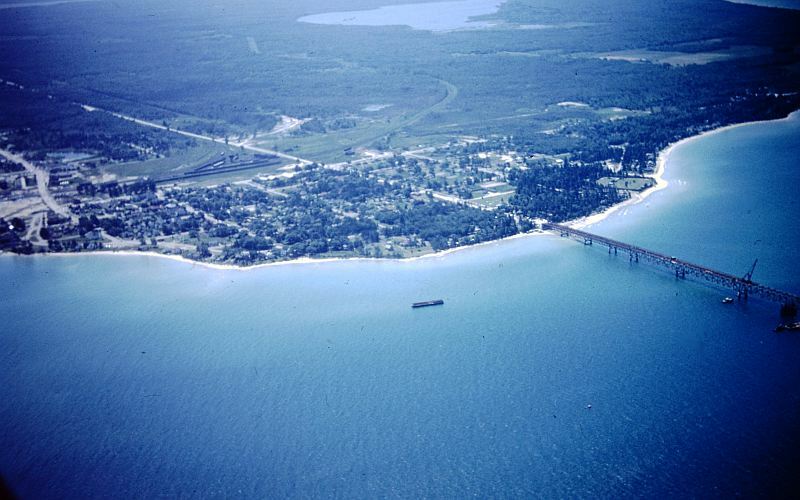 Michilimackinac State Park campground (closed in 1971) can be seen at left. then topped with the roadway stringers which can be seen atop the three center sections of the truss. Barges used for floating Mackinac Bridge superstructure into position. 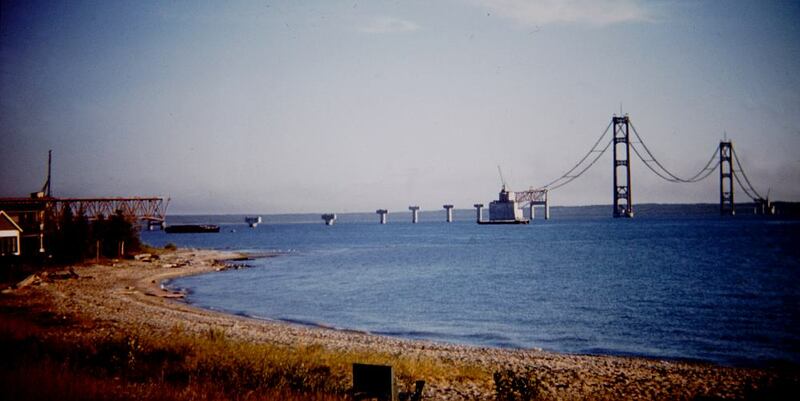 Mackinac Bridge span being assembled on shore before being towed into position and raised into place. 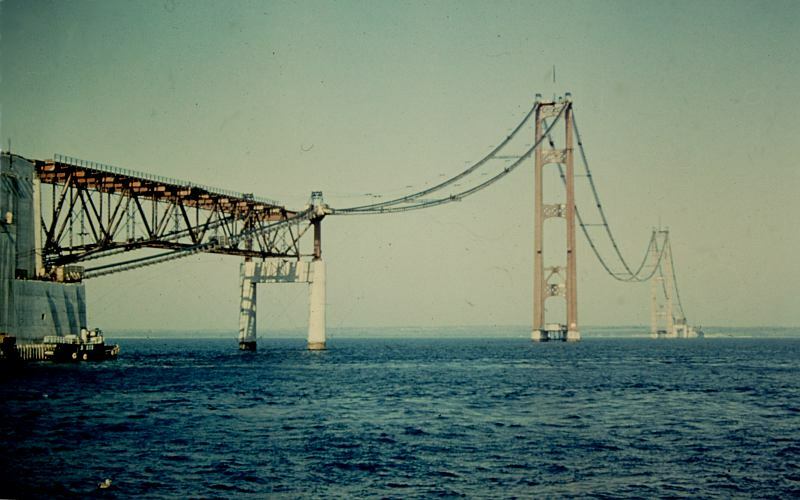 The Mackinac Bridge towers stand 552 feet above the average water level - this photo is from 1956. 762 foot tall tower, 210 feet below the water line and 552 feet above. 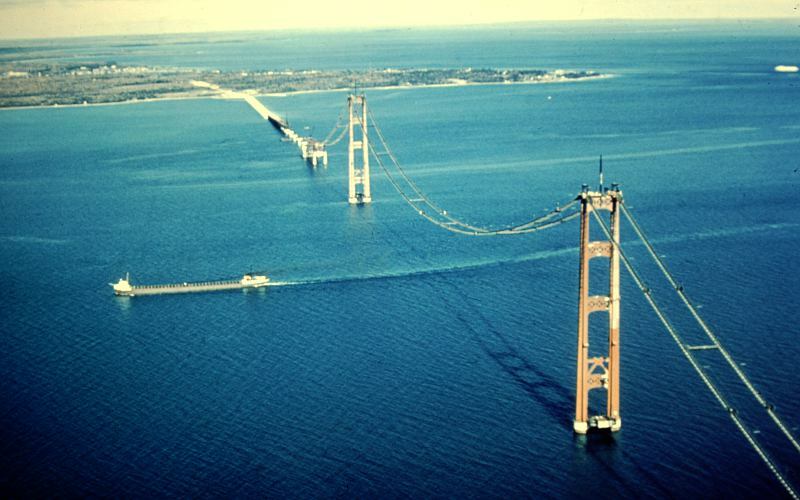 Temporary catwalk in place before the start of the construction of the Mackinac Bridge cables. 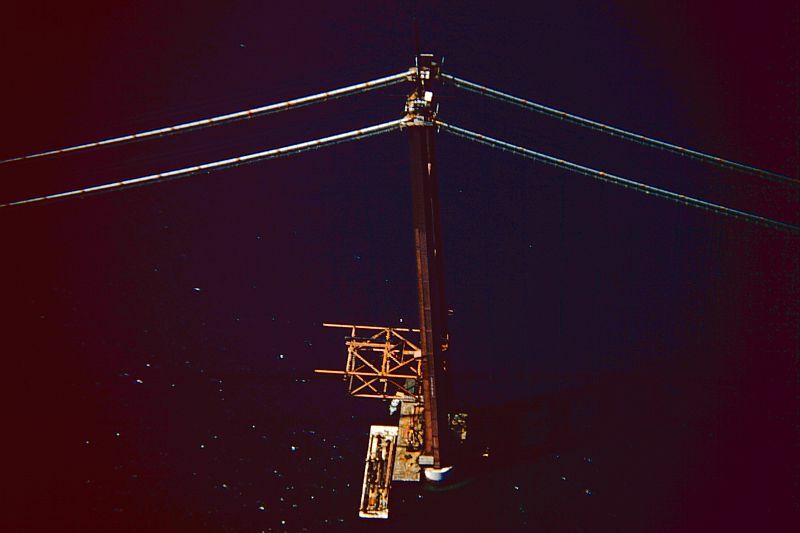 Construction of these catwalks was very hazardous and two Bridge workers fell to their deaths during their construction. 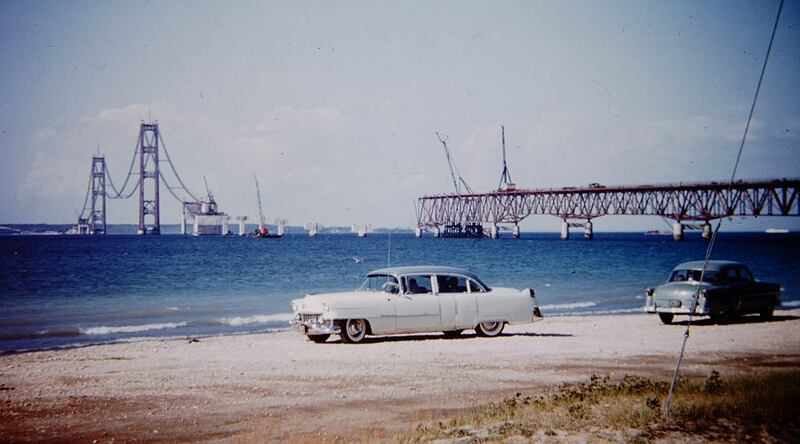 Mackinaw City during the Mackinac Bridge construction, before construction of the approach. Mackinac Bridge construction viewed from Mackinaw City, Michigan. A Great Lakes freighter passes under the growing Mackinac Bridge. The Mackinac Bridge main cables are now well along. Copyright 1954 -2017 by Keith Stokes. These photos may not be reproduced without written permission. .